The ukiyo-e woodblock print is undoubtedly one of the most recognisable of Japan’s diverse art forms, and Kitagawa Utamaro (1753?-1806) is its quintessential exponent. Already celebrated as a master of the ukiyo-e print during his lifetime in late 18th-century Japan, he was introduced to the West at the turn of the 20th century as a painter of the Green Houses (Yoshiwara pleasure quarters). Utamaro achieved his first breakthrough in the late 1780s as an illustrator of sumptuously printed poetry anthologies and erotica. 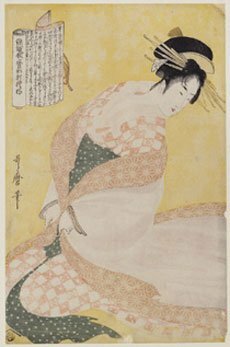 With the introduction of bust or half-length formats to the popular genre of bijinga (pictures of beautiful women) in the early 1790s, he revolutionised the way women were portrayed in Japanese visual arts. His sensuous and insightful portraits of women from all walks of life – aloof courtesans, diligent housewives, affectionate mothers and passionate lovers – have enjoyed unabated popularity in Japan and worldwide. Featuring around 80 prints from the renowned collection of the Asian Art Museum, National Museums in Berlin, this exhibition is the first extensive survey of Utamaro’s work in Australia and also includes work by his contemporaries and followers. The exhibition’s title takes its inspiration from the poem of the same name by Charles Baudelaire. Baudelaire’s adoration of beauty might well find resonance with viewers of Utamaro’s tantalising images of beautiful women. For more information, read the exhibition texts and room brochure.